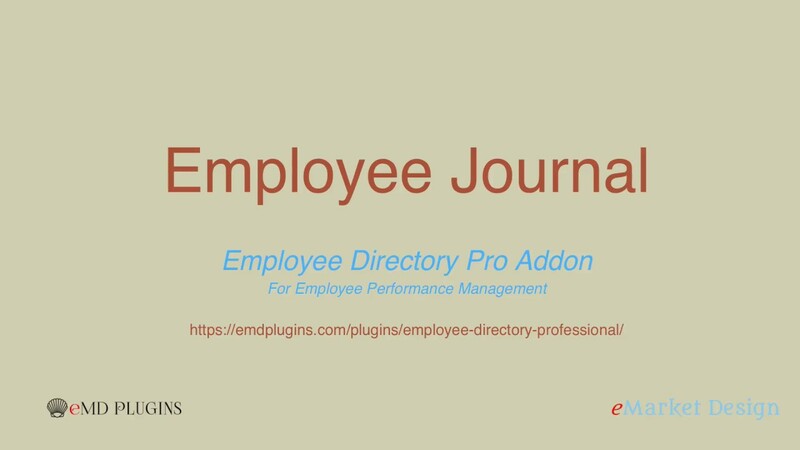 Employee Journal addon is a powerful performance management system. It helps organizations get more out of their employees. Timely completion and delivery of performance reviews. Role based review access to control who sees what. Alignment of employee competencies with with organizational goals. Effective and efficient journaling to track and trace employee development progress. Customize the review content with clickable template tags. Classified with category and subcategories(competencies). Set up a follow up date. Filter through reviews by created date, follow-up date, category/subcategory and title. Print the selected or all reviews in PDF format. Managers can only see the reviews of the employee reporting to them. Managers can not edit the reviews once they are submitted. Higher tiers can see and edit lower tier employee reviews without limitation. 2 tier employee and manager roles can be used in flat organizations. Confirm message: The message to be shown before reviewer saves a journal entry. New entry email: The email message to be sent when a new journal entry is saved. You can specify who will receive the new journal entry notification emails by their email addresses or WordPress user names. Follow-up emails: the email message to be sent on the follow-up date. You can also send follow-up emails on demand. The follow-up email sending process is logged for debugging and ratification. Reminder emails: the reminder email message to be sent before the follow-up date. You can set the number of days reminder message will be sent before the follow-up date. The reminder emails can be sent on demand and logged as well. Categories can be color coded to contextual differentiate competencies. Subcategories can be used to further group core competencies.